EURAXESS TOP IV "Open EURAXESS"
TOP IV began in September 2018 and will be finished in August 2021. General aim: to further intensify the services provided by the EURAXESS Service Centres, expand the mandate of supporting the career development of mainly young researchers in Europe with particular focus on female Higher Education Institution students and researchers. Establishing EURAXESS Career Development services. Supporting the enhancement of services for researchers across all national networks, such as dual career support, social twinning activities and diversity management (with a focus on gender and multicultural issues). Developing new services oriented to a better connection between academia and industry, including raising awareness on scientific entrepreneurship. Capacity building for EURAXESS members. Stronger promotion of the EURAXESS initiative, including the engagement and collaboration with other relevant networks initiatives. Further improving the support to Third Country researchers in Europe, particularly in collaboration with the EURAXESS Worldwide chapters. Support the development of the EURAXESS national portals. Within the project FECYT's role is primarily linked with reinforcing EURAXESS support to intersectoral mobility through the piloting of an intersectoral mentoring programme, contributing to the development of entrepreneurship content for EURAXESS portals, and to the promotion of EURAXESS to non-academic employers. FECYT will also contribute to raising awareness on the need of implementing career development policies and will share its experience in fostering the engagement of national institutions in the HRS4R. Finally, as a EURAXESS Spain BHO, FECYT is responsible for managing the project funds assigned to each national network through the internal call system (Network Call). I AM A MEMBER OF EURAXESS SPAIN. HOW CAN I GET THE MOST OUT OF EURAXESS TOP IV? 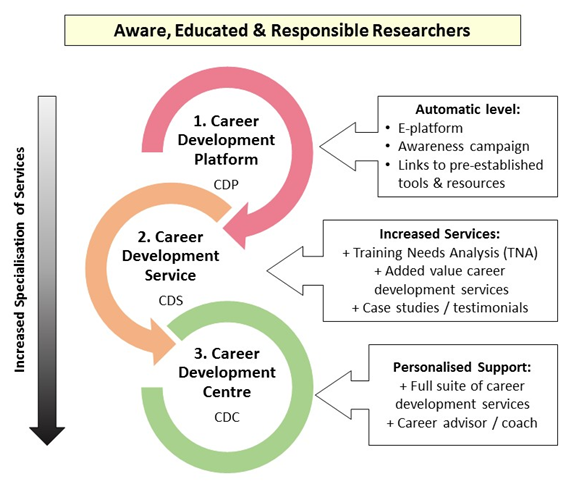 TOP IV will have a very strong focus on supporting the uptake of career development services by the EURAXESS service centres, based on the EURAXESS Career Development Model developed in the previous TOP III project and building upon the tools and resources created also within TOP III and other recent projects. Furthermore, good practices on extended services for researchers will be created and several capacity building actions for national network members such as study visits, regional and network-wide trainings will be organized. The Network Call funding will cover the participation in many of these activities, so stay tuned for updates and contact us for more information.